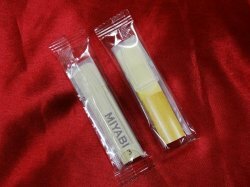 "MIYABI" saxophone reeds are made of high quality select cane. Easy to play. 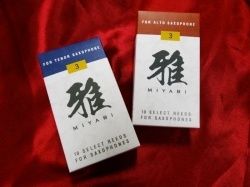 They are slightly softer than typical brand reeds. Double cut. Available in 21/2, 3 and 3/1/2. 10 reeds in a box. Worldwide shipping $4.00 by air small-packet. Add $2 for EX = professional grade.